This entry was posted on Sunday, December 13th, 2015 at 11:04 pm and is filed under DNA, Family, Worthington. You can follow any responses to this entry through the RSS 2.0 feed. You can leave a response, or trackback from your own site. That’s really exciting Russ. I have one ancestor letter and that’s all. I can’t wait to hear more or have you share the letters with us, if you choose to. I have a few letters, but these will be most interesting, I can tell. Just trying to figure out how quickly I can make an in-person visit. She must have asked 5 times for met to come visit. Am now following some of my hints on her line, and already have some questions for her. I am still getting to grips with the understanding of it and a blog post will be written in due course. I was a little disappointed that there were so few connections with Italian ancestry and no Orlando’s but many Italians are not interested in DNA and it is a case of being patient and there were a few who did link to my maternal line and that was clear because they gave ancestral surnames whereas some did not. I had 160 matches and I emailed all of them. Extending the hand of genealogical friendship – I wrote at about 3am UK time and when I got up at about 8am I had 26 emails and more are still arriving! My FTDNA Surname project was Y-DNA which is how I found a Non-Paternal Event took place about 1600 +/- 50 years. I think that the Surname project is really a part of a One Name Study project. The Family History Society member “owns” the Surname at GOONs. That OK, because they / we are working on a 17th Century project. 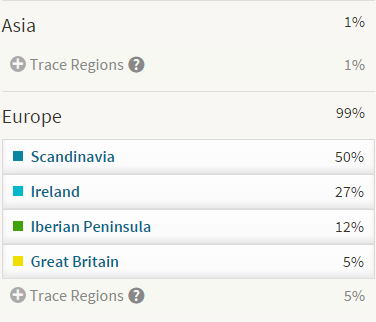 I haven’t moved my AncestryDNA over to FTDNA (yet), because I have some pretty solid leads (hints) on Ancestry and addressing them one at a time. Also, in my tree is a cousin who is trying to find her mother’s natural parents. That is where we have to find a Place and Time DNA match. You “genealogical friendship” approach is the one I used and the result has been awesome, specifically in this case. Like much research that we do, it takes time.